Readers' Favorite Outfits of 2018, Evening Division: Vote Now! Quick programming note: Our next post will be coverage of the annual New Year banquet sparkle, stay tuned. 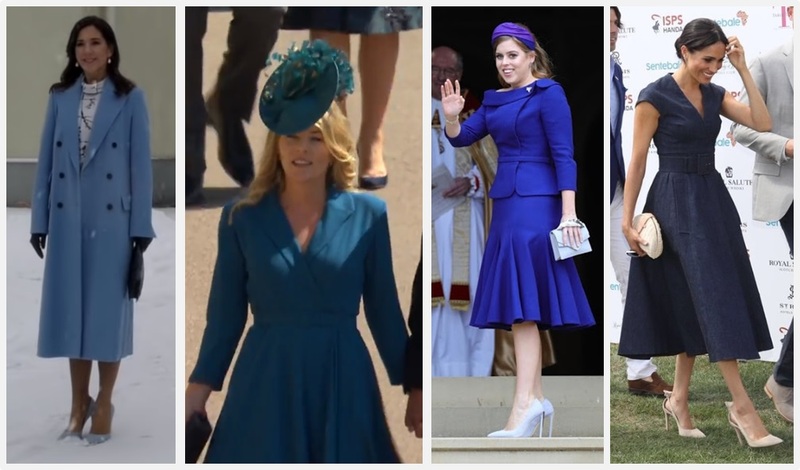 Yesterday was the Day & Cocktail Division; today we move on to the Evening Division in the race to elect your favorite 2018 royal outfits. 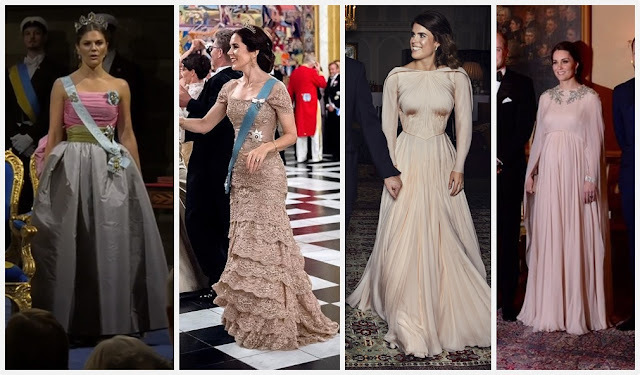 Which were your favorite royal evening outfits of 2018? Readers' Favorite Outfits of 2018, Day & Cocktail Division: Vote Now! 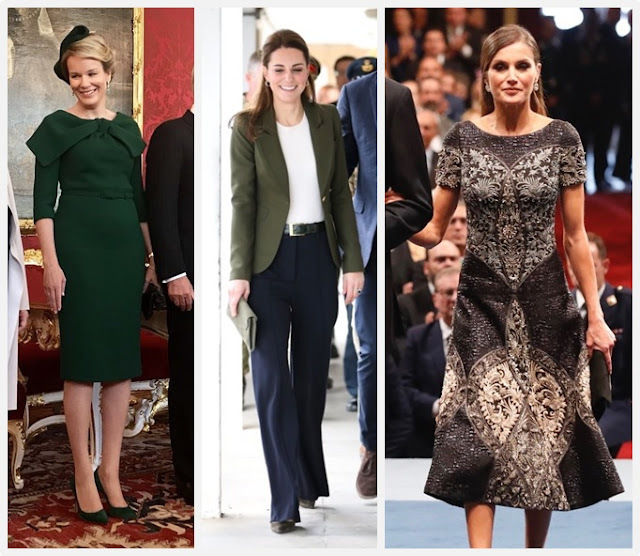 It's time once again to elect your favorite royal outfits of 2018! We have two votes: today's Day & Cocktail Division (which I am defining as day plus anything evening that's shorter than full length) and tomorrow's Evening Division. I chose 25 of our favorite outfits worn in 2018 from each division for your voting pleasure - not necessarily the 25 most commented on outfits, just aiming to get a well-rounded selection that represents this royal year. Which were your favorite royal day & cocktail outfits of 2018? No one that has been paying any attention will be the least bit surprised to see that the Duchess of Cambridge has ordered up another color of a favorite outfit (a Catherine Walker coat, owned also in green, with another Jane Taylor headband, and worn with her oak leaf brooch). Likewise, no one that has been paying any attention will be the least bit surprised to see that the Duchess of Sussex has ordered up another navy outfit (Victoria Beckham this time). Per usual x2. Deep colors were also the name of the game for Autumn Phillips and Princess Beatrice, both sporting Claire Mischevani, and Princess Eugenie in festive red. I'd tweak all three of these looks just a littttttttle bit, although I am prepared to offer up my applause to Beatrice for throwing a hat brim into the family mix. On the lighter side, have some refreshing bright blues courtesy of the Countess of Wessex (in Suzannah) and the Princess Royal. Is Sophie my fave this year? Maybe. Just maybe. And finally, bless Zara Tindall for bringing some cheer into my Christmas review by flying the flag for the Purple Is A Neutral club. Every little bit helps our cause. ...right after this programming note: Our next post will be the Christmas round up, probably on the 26th, and then you'll want to stay tuned to cast your votes for your 2018 favorites! 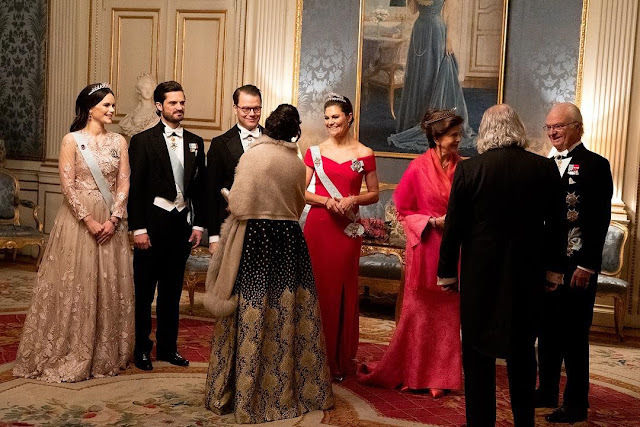 Our one limited glimpse of this gown in action is all I need to call it one of the most interesting - and intricately made - dresses of this royal year. Satisfying my need for more royal Ralph & Russo, this was a stunning turn for Princess Beatrice. Another contender for the year's best was her faux bow Gucci dress. Eugenie's wedding offered a few bests for the year. Sarah broke from her usual color schemes in a big way, to delightful effect. 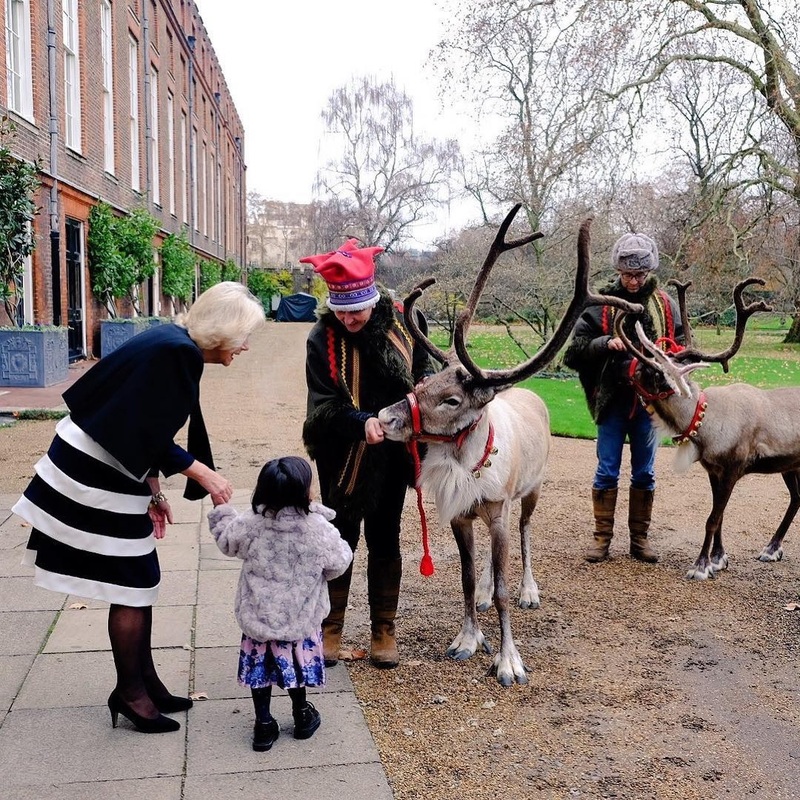 Another nod from the event goes to Lady Gabriella Windsor, who combined her blues in a fun way. What, like a sparkly caped thing wasn't making this list? This high-impact gown won my heart at the Nobels. Sofia also impressed earlier in the year with her green halter top dress at the Polar Music Prize. 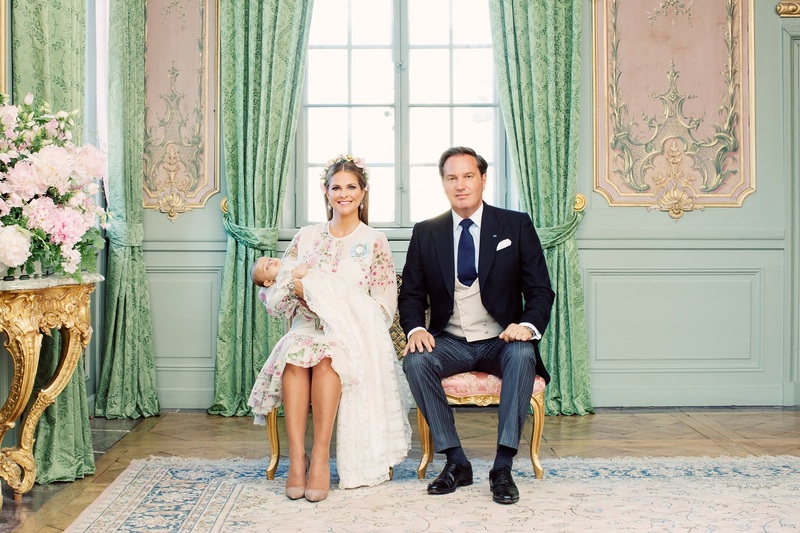 Did this floral really win me over, or was it just the fact that Madeleine wore pieces of the Cameo parure for the first time? Probably the latter, but hey, whatever makes it memorable. Listen, I just love the fact that what was arguably the most fun evening ensemble of the year came from Charlotte. Feathers for everybody! I think I loved everything we covered Beatrice wedding this year, which is some kind of record: black velvet maternity from Alberta Ferretti at the Rose Ball, fur and fringe at the Ocean Gala, the delicious Armani Privé ensemble above from National Day, and the liquid gold number she wore to the National Day gala. 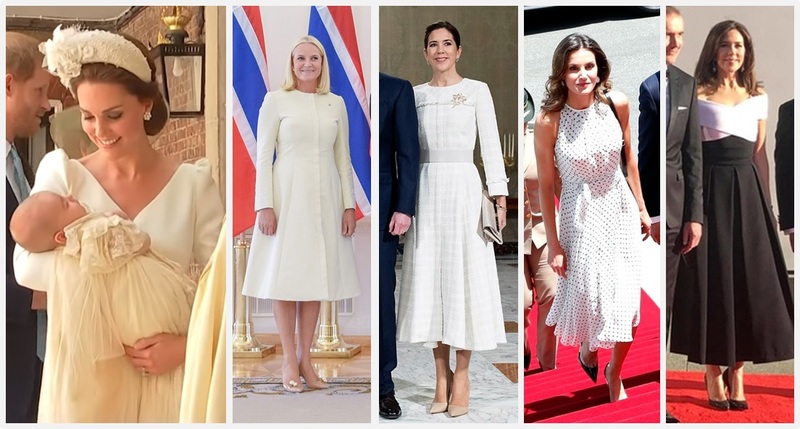 What other royal outfits made your list of 2018 favorites? Our next two ladies in the spotlight ended up on opposite ends of the spectrum for my personal 2018 favorites. For my end of the year favorites, I usually draw heavily from the year's tiara appearances - but weirdly enough, my top Kate outfits for the year stayed on the less formal side of things. The accessory interest on this Erdem tops my list. Two outfits from two related events earlier this month take my runner up spots: an Emilia Wickstead skirt and cardigan, followed by a wide leg trouser and blazer appearance. Victoria, on the other hand, ended up with a list completely taken from the year's tiara appearances. It was a bit of a three-way tie, but I'm giving top prize to the go big or go home spirit of her foray into Queen Silvia's closet for the Nobel ceremony. ...as does her sleek green gown with emeralds and diamonds from November. What were your favorite 2018 outfits from Kate and Victoria? 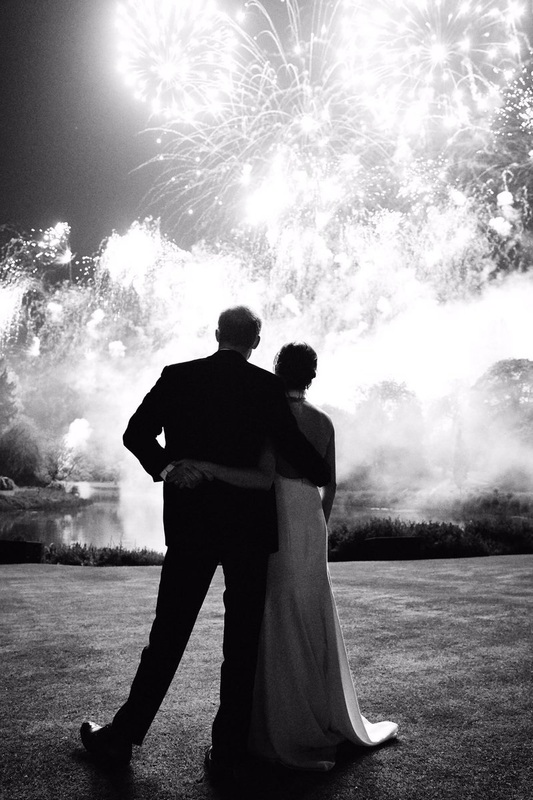 Next up in our review of 2018's individual bests: two who brought their A-game for two of 2018's biggest royal events. This outfit is one of the only tmes I have quibbled with a cape, and yet the memory of this appearance with the Stuart Tiara at full blast is so strong I didn't even come up with any runners up from the evening category. 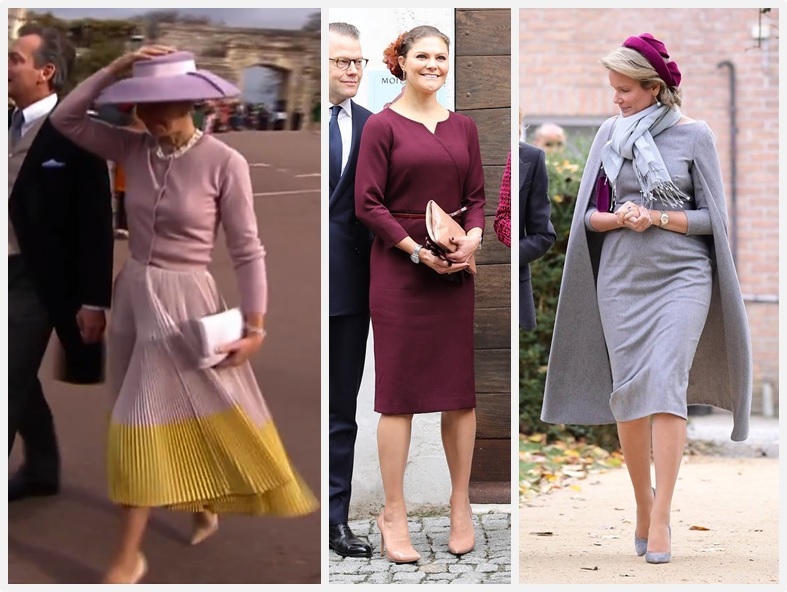 Matter of fact, the only two runners up I did come up with both hail from the same visit: her Claes Iversen soft pink arrival outfit and her Oscar de la Renta hot pink departure outfit. Detailed but delicate, Mary's tiered and lacy dress would definitely make my top 5 dresses of 2018 list. Near to the top. Princess perfect, as per usual. Mary usually starts the year with a strong contender in her gown for the New Year gala, including this year's red Soeren Le Schmidt dress. I gotta give some love to her tartan McQueen skirt from earlier this month, while we're at it. 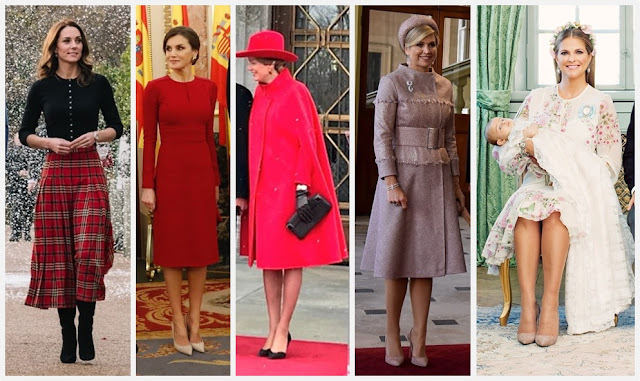 What were your favorite 2018 outfits from Mary and Máxima? We did a little Readers' Favorite Outfits vote(s) last year and we're planning on doing it again this year! This week, I'm picking my personal best outfits of the royal year for some of our regulars, plus others. I take your faves into consideration when deciding what we'll vote on, too, so make sure you comment with your personal favorite outfits on the appropriate post! My picks for the best outfits of the year begin with the Ladies in Velvet. I enjoyed the red Dior Mathilde wore at the start of the French state visit, though many of you disagreed with me. 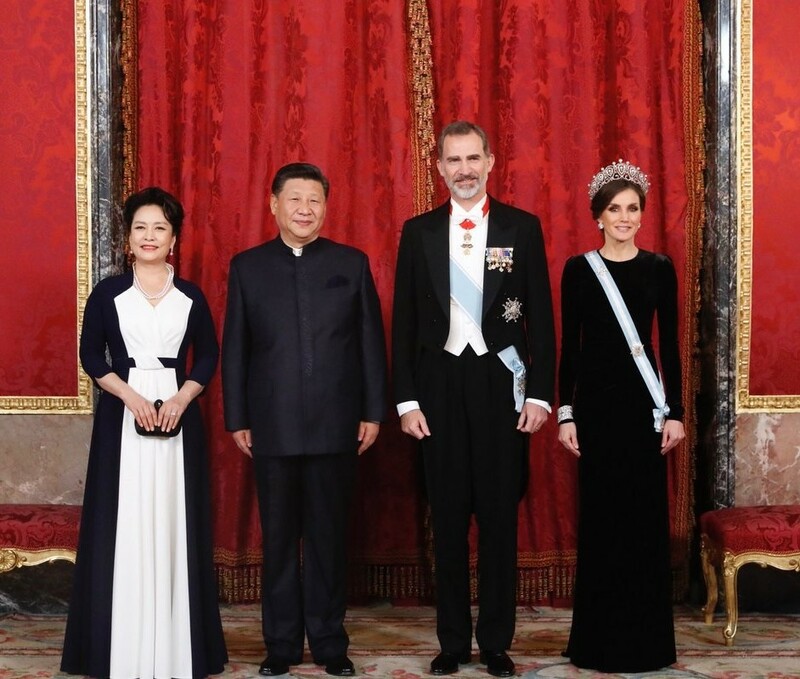 We sense we would have had a much better consensus on the caped dress with purple/magenta accessories on Day 2 of the French state visit, although we did not get to cover it here. This is a 2017 repeat but it really shines for me in 2018. It's sleek, luxurious, and the perfect modern way to showcase some of Spain's biggest gems. How is a swishy Carolina Herrera polka dot dress not going to make my list? We simply CAN'T have a Letizia best of the year list without a bit of red; her new favorite daytime special occasion Carolina Herrera dress will meet that requirement nicely. I honestly didn't know what I was going to pick for our newest regular in her first full royal year - until THIS happened. Wouldn't have objected to a dangly earring here, but otherwise: SOLD. That black Emilia Wickstead in Ireland stands out on a second glance for me. What were your favorite outfits from 2018 for these three women? --In the vote for your favorite 2018 tiara surprise, who rose to the top but the one and only Queen Máxima and her use of the Stuart Tiara! Máxima took home 47% of your votes, easily holding off your runner up with 34%, Princess Eugenie and the debut of the Greville Emerald Kokoshnik Tiara. Another big British tiara moment, the Duchess of Sussex in Queen Mary's Diamond Bandeau Tiara, took third place with 10% of your votes. --Princess Eugenie missed her chance to take the tiara prize, but the love for her wedding look carried her to victory as your favorite 2018 royal wedding gown! Eugenie and her Peter Pilotto gown grabbed 49% of your votes. Meghan followed her with 31% of the tally, while Alessandra took 14% and Ayako nabbed the remaining 6%. 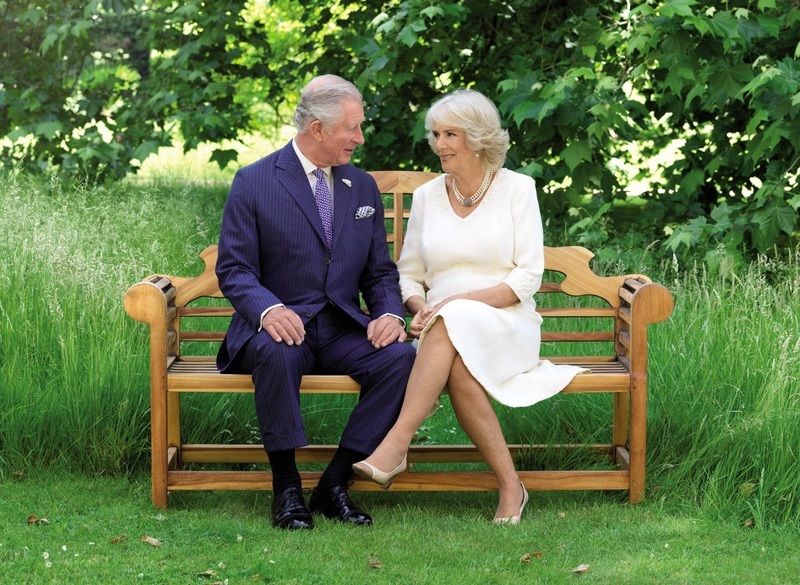 --The usual parade of royal Christmas cards is in full swing! 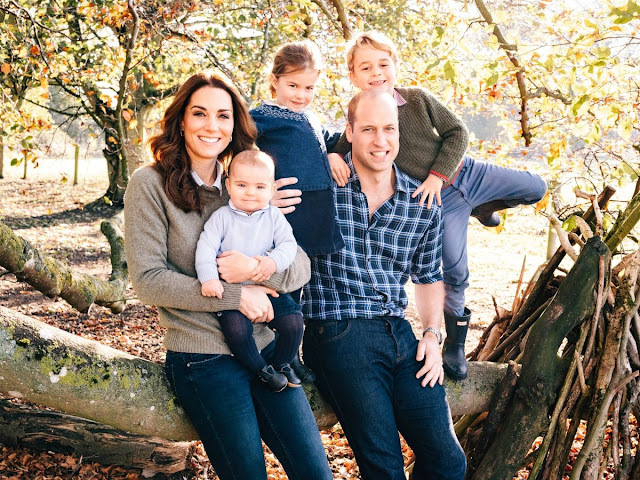 The Windsors contributed with the release of cards from Chaz and Cams, the Cambridge fam, and the Sussex pair. Taken by Hugo Burnand in the gardens at Clarence House over the summer. Taken by Matt Porteous at Amner Hall. Taken by Chris Allerton during their Frogmore House wedding reception. 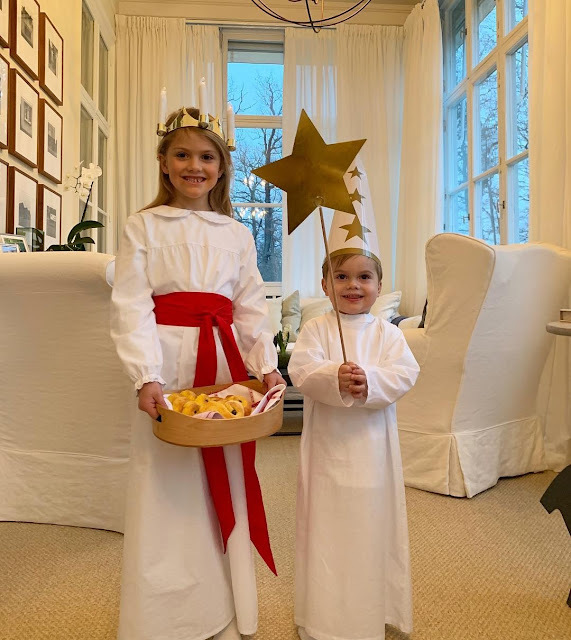 --And in Sweden, the royal court shared a picture taken by Crown Princess Victoria of Princess Estelle and Prince Oscar celebrating St. Lucia Day last week. --And finally, over at the Jewel Vault: a little holiday party fun for Her Maj, plus a vibrant pink outfit. Coming up this week: We continue finishing up 2018 with plenty of outfit favorites. Get your memories rolling and your suggestions ready. 2018 loaded us up on royal wedding gowns, with two big headliners from Britain and others beyond. It's all leading to the inevitable year-end question: which one was your favorite? Alessandra de Osma wore an embellished gown from Jorge Vázquez to marry Prince Christian of Hanover in Peru in March. I think it's fair to say she claimed the title of Biggest Wedding Tiara of the Year by topping her look with the Hanover Floral Tiara. Meghan Markle turned to Clare Waight Keller of Givenchy for her May wedding to Prince Harry. She took home the Longest Wedding Veil of the (Royal) Year prize with her Commonwealth floral-embroidered veil anchored with Queen Mary's Diamond Bandeau Tiara. 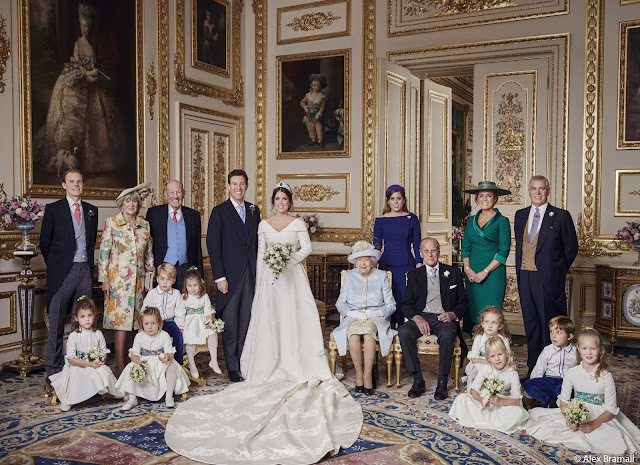 Princess Eugenie made a touching statement at her October wedding to Jack Brooksbank by asking Peter Pilotto to make her a veil-free gown that showcased the scoliosis surgery scar on her back. She grabbed the Most Colorful Wedding Tiara of the Year award by becoming the first (known) member of the royal family to wear the Greville Emerald Kokoshnik Tiara. 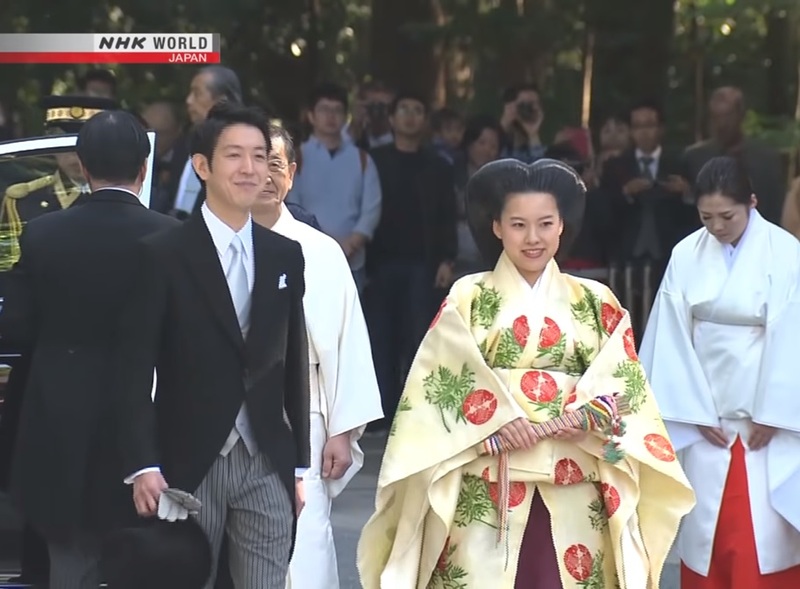 Princess Ayako claimed the Most Colorful Wedding Ensemble title with her array of traditional looks for her October wedding to Kei Moriya. Pictured is just one of her looks - and she even managed to squeeze in one final tiara appearance. 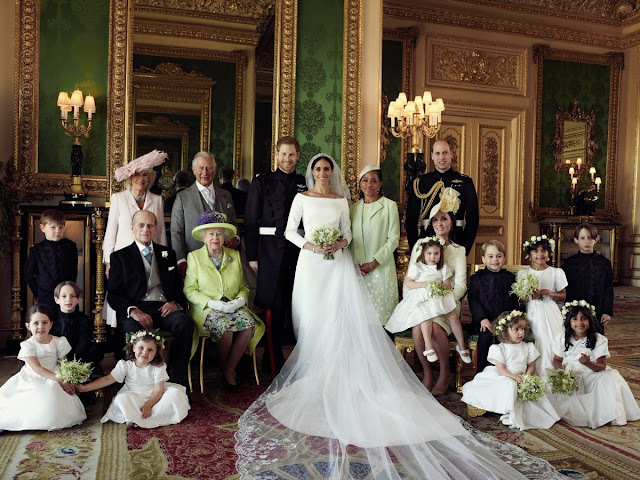 Which royal wedding gown of 2018 was your favorite? Which of 2018's royal wedding gowns was your favorite? Yes, it’s time to begin wrapping up 2018. We’ll start with a round up of this year’s tiara happenings. It’s been an eventful year in diadems! There were quite a few developments beyond the royal tiaras we saw worn this year; tiaras were sold (Queen Alexandrine's Russian Sapphire Tiara, the whole Bourbon-Parma auction, and more), tiaras went on display (the trio of Fife tiaras at Kensington Palace! ), and unfortunately, certain things also disappeared (shame on you, thieves of Swedish royal regalia and the Portland Tiara). 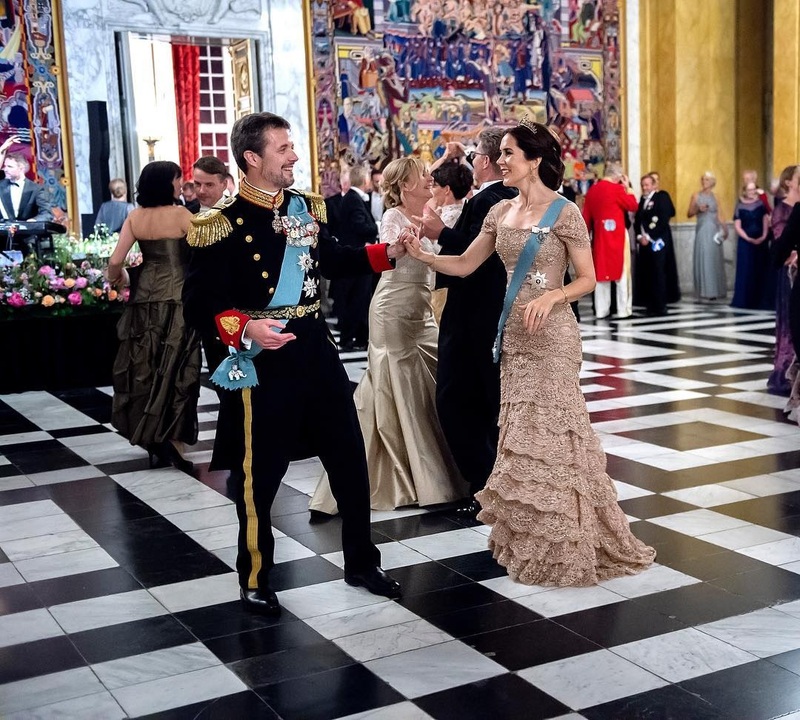 This year also gave us plenty of opportunities to see tiaras in action, from a big tiara’d up royal gathering (that marvelous festival of fringes at Frederik’s 50th birthday party) to wedding tiara surprises and more. You can scroll back through alllllll the tiara appearances we covered in 2018 here. Any 2018 tiara round up has to start with the reappearance of the Stuart Tiara, right?! Some of us have been waiting patiently (or not so patiently) for Queen Máxima to resurrect the biggest of all the Dutch big guns, unseen since Queen Juliana’s reign. She delivered twice: debuting a smaller version in Luxembourg and the whole monster in the United Kingdom. 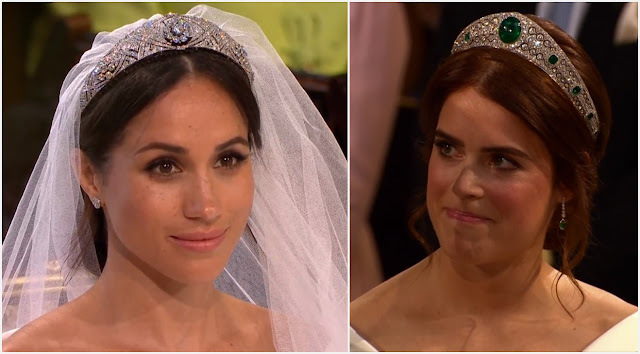 Weddings brought even more reappearances – and, in the case of the British royal family, confirmation that two mysterious tiaras do indeed still exist in the vault: the Greville Emerald Kokoshnik Tiara (worn by Princess Eugenie) and Queen Mary’s Diamond Bandeau Tiara (worn by the Duchess of Sussex). Slightly outside of the royal realm, another wedding also gave us an opportunity to see the Spencer Tiara in action once again. 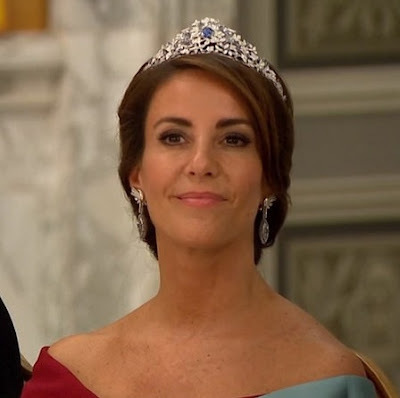 Princess Marie’s tiara access finally increased in 2018, with the addition of the Nuits Claires Tiara courtesy of an arrangement with Mauboussin. It’s a rare treat to see a newly made tiara in action. 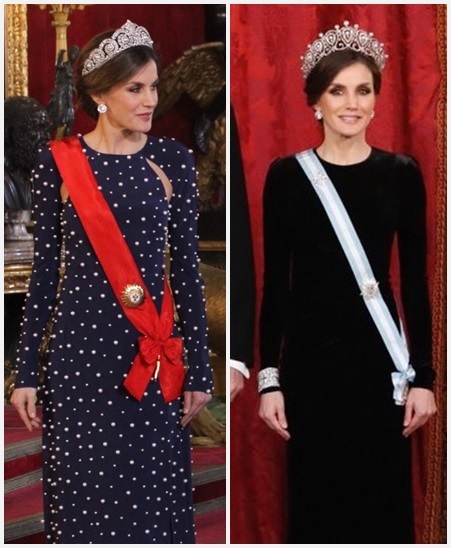 Queen Letizia headlined last year’s tiara happenings by wearing the Fleur de Lys Tiara for the first time. She followed that up in short order by debuting the two other largest tiaras in the Spanish collection: the Cartier Diamond and Pearl Tiara and Queen Maria Christina’s Cartier Loop Tiara. Elsewhere, Hereditary Grand Duchess Stéphanie continued her run through the Luxembourg vaults by debuting the Chaumet Diamond and Pearl Choker Tiara. What was your favorite tiara surprise of 2018? What was your favorite tiara surprise in 2018? The Dutch and Swedish ladies are here to squeeze in the last tiara events of 2018, bless 'em. The King and Queen of the Netherlands welcomed the President and first lady of Cape Verde to the Netherlands for a state visit on Monday, including a state banquet. 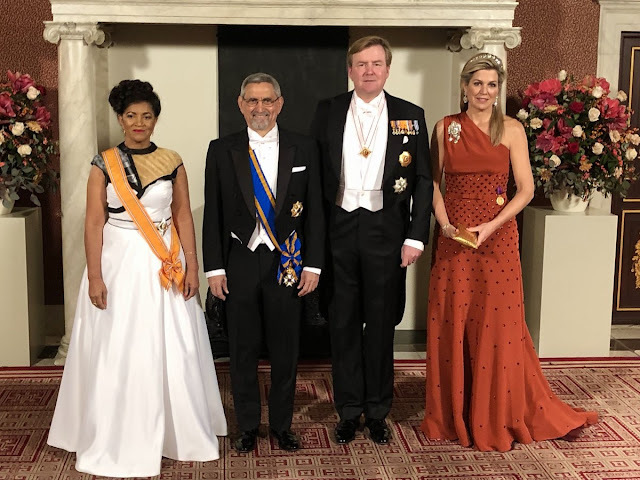 Queen Máxima continued her recent Claes Iversen streak with this burnt orange gown for the state banquet. This is the third time we've seen this dress and the second time with a tiara - to be honest, it would be neither my first pick for a triple repeat nor my first pick for one tiara appearance, let alone two. Máx clearly disagrees. Fair enough. Anyway, she's provided ample distraction by loading herself up with the biggest diamonds worn in the most amusingly casual fashion. The Dutch Diamond Bandeau's tossed on like an afterthought (I mean, it's a good hairdo, this is just one of those times when she really is wearing it like any old headband, which I find hilarious). And she's continuing to find new-to-her treasures in the family vault; this mega brooch with a big fat yellow diamond in the center belonged to Queen Emma. The brooch was one of Queen Emma's wedding gifts, part of a set that also included the diamond rivière that was later made into the Diamond Bandeau. It's a diamond reunion! We also have some Bonus Beatrix, yay. Princess Beatrix wore the Antique Pearl Tiara, a diadem I enjoy more each time we see it. The Swedish royal family hosted the King's Dinner for Nobel laureates last night. 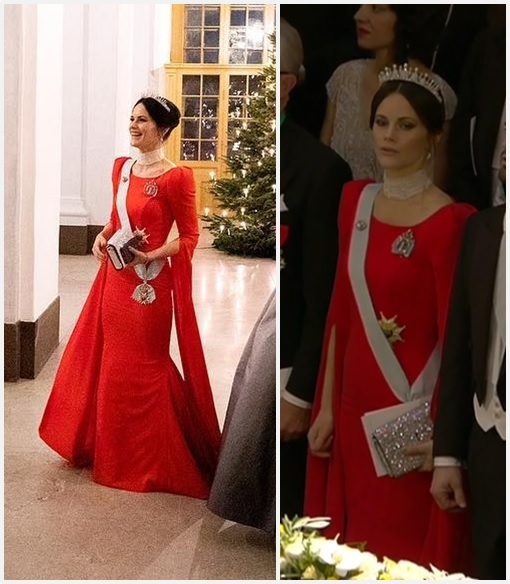 Princess Sofia's custom gown from Valerie by Valerie Aflalo was a bit fussy for my tastes (the sleeves, I blame the sleeves). Like most things, it could have been improved by an amethyst tiara - she was already wearing the earrings, bracelet, and brooch from Queen Josephine's Amethyst Parure. Swap out the all-diamond version of your Emerald and Diamond Tiara while you're at it, Sofia! 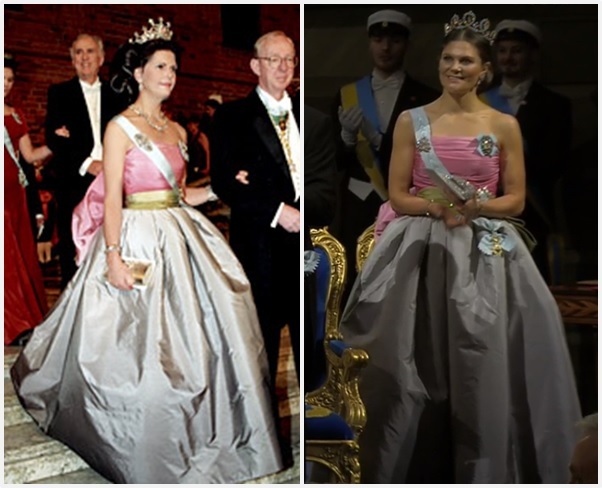 Queen Silvia wore a pink Jacques Zehnder dress - itself a former Nobel ceremony selection - with a refreshing tiara choice: the Baden Fringe. We've seen her wear it in 2016, 2017, and now 2018. (And before that, obvs, this is just a seeming renewal of enthusiasm.) 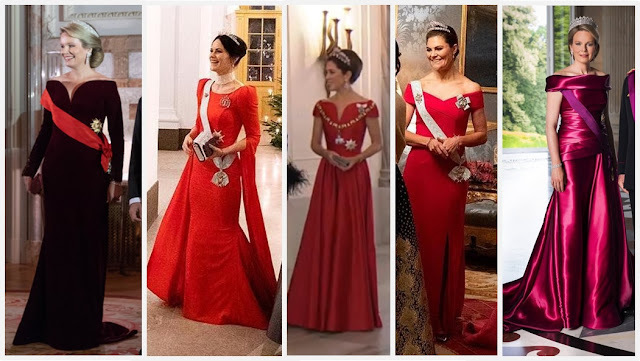 No one wears it like Crown Princess Victoria does, but I must say, I enjoy seeing other takes on it. Fringes (or amethysts) for everyone! --Over at the Jewel Vault: Flame Lily Alert! --And finally, a seasonal requirement: Christmas trees at Buckingham Palace, set to (what else) the Nutcracker. 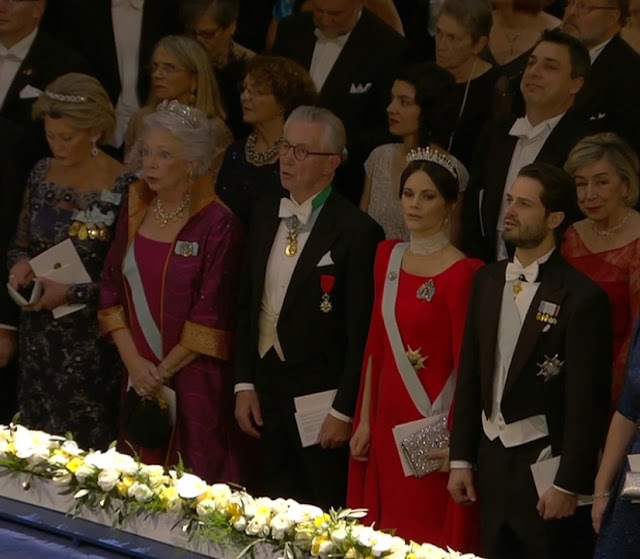 Coming up this week: First we will have MORE TIARAS, from the Netherlands and also night 2 of Nobel glitter. Then it's time to start wrapping up the year with our traditional Best Of reviews! 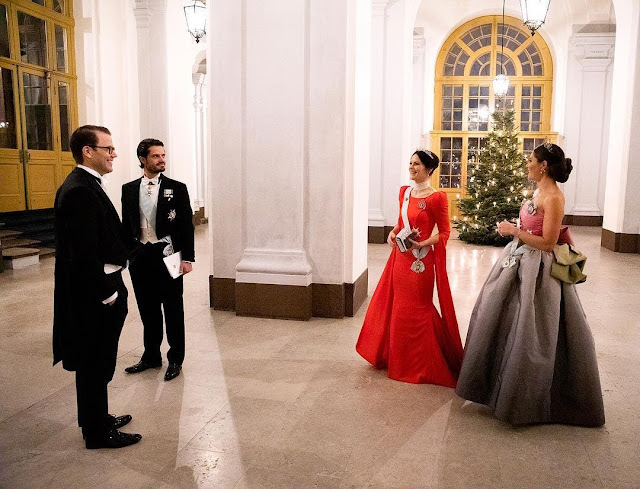 Prince Daniel, Prince Carl Philip, Princess Sofia, and Crown Princess Victoria wait to leave the palace in this photo shared by the Swedish royal court. 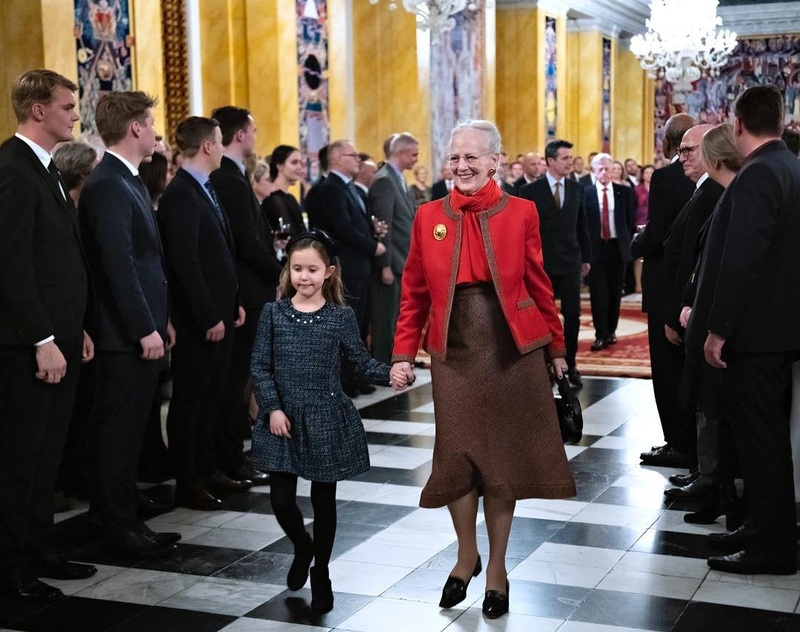 It’s actually a little surprising it took this long for one of Queen Silvia’s old Nobel gowns to take the stage again, given how much digging through her wardrobe her daughters have been doing in recent years. Victoria chose the Nina Ricci gown her mother wore to the 1995 Nobel ceremony today – classic old school Queen Silvia, with the BIG skirt and the BIG back bow. It could be very easily dated and I’m sure for some of you it will be…but call it my weakness for a giant ball skirt, I think she’s pulling this off. Victoria wore the Connaught Tiara once again, with Silvia’s diamond floral earrings and the rose brooch from the Braganza parure. 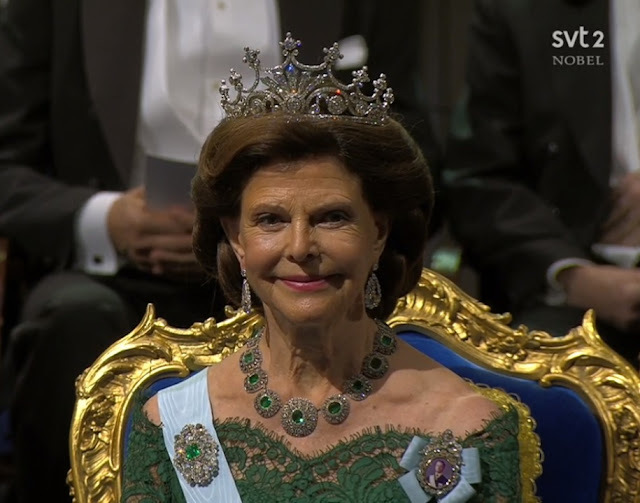 Did Queen Silvia note her daughter’s divine use of the Bernadotte Emerald Demi-Parure with a green gown last month and decide it was a splendid idea to continue? All I know is that it was a splendid idea. If Victoria was classic old school Silvia today, Silvia herself is classic new school Silvia. She broke her streak of evenly alternating the Nine Prong Tiara with the Leuchtenberg Sapphire Parure for a second Pronger year in a row, and I don’t even mind. I’m too lazy to see how many years in a row Princess Christina has won my heart by making some of my least favorite Swedish tiaras look good. She’s the undisputed queen, owning the Six Button Tiara like only she can. Also, I love when she does this evening coat-style look. Luxurious fabrics galore. The power of a red dress is real, and this Zetterberg Couture number is a RED DRESS. I’d take the sleeve pouf down a notch, yeah, and yet I still love what Sofia's got going on here. This look has impact. 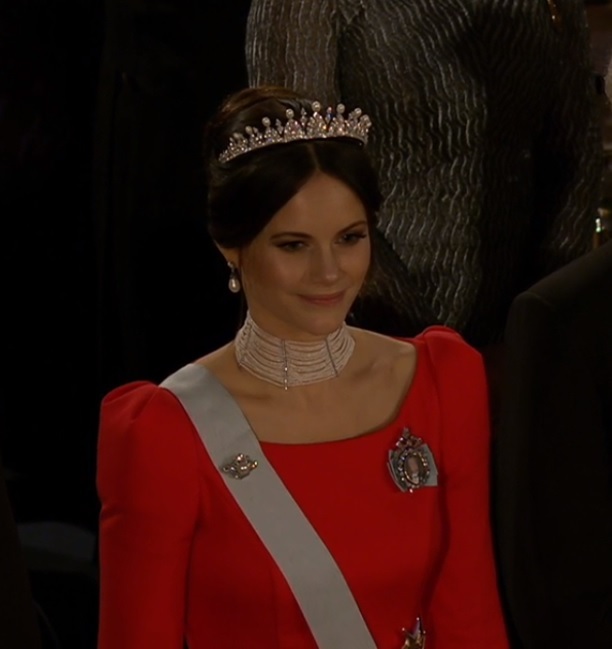 Sofia also has some jewel intrigue happening; I thought her pearl choker (which is a debut for her tonight) was the same historical piece previously worn by Princess Madeleine, but it is different and something privately owned. Tall chokers are not easy to wear and she’s doing it in truly regal fashion. I love that she’s carried the pearls through with the rest of her jewels, using the pearl version of her Emerald and Diamond Tiara, plus pearl earrings and a pearl brooch. I really never include the Nobel laureates here because, well, it's just best if we stick to our royal wheelhouse. But I must say this year what an absolute treat it was to see the two women laureates looking so elegant on their big night. Donna Strickland (in red) is a co-laureate for the Nobel Prize in Physics – just the third woman to win it, and the first in 55 years – for her work in groundbreaking inventions in the field of laser physics. Frances Arnold (in blue) is a co-laureate for the Nobel Prize in Chemistry – the fifth woman to take the prize in history – for her work in the directed evolution of enzymes. 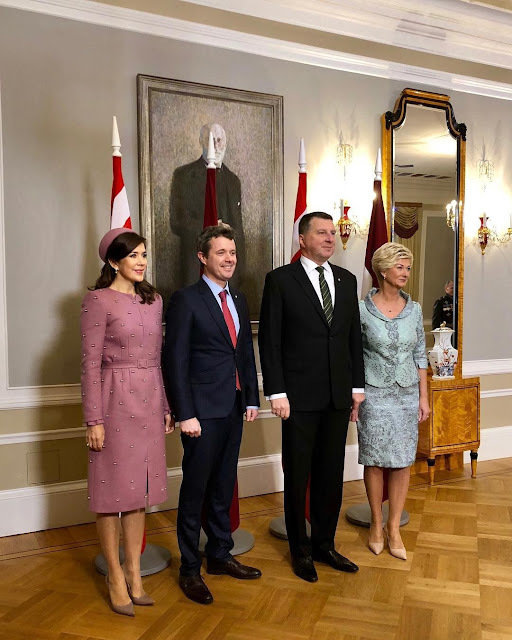 The treat of the day in Norway was not in jewel form – different ceremony and different subject matter, so appropriately not a gala event – but in simply seeing Crown Princess Mette-Marit looking well in her new Fendi dress. She was a late add to the guest list. Queen Sonja repeated her purple velvet Pucci jacket, much worn and with good reason. Plus a sequin beret, because why not? Who makes your best dressed list for Nobel 2018? The festivities are not done! 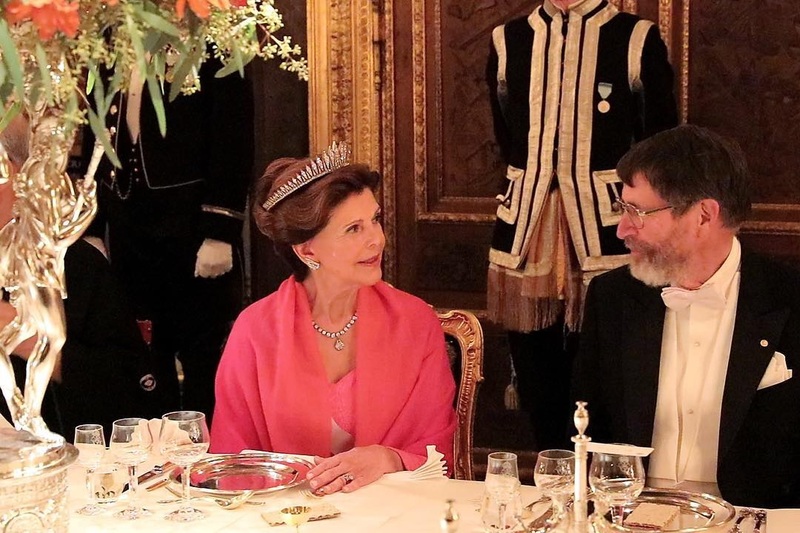 There’s a dinner in Oslo tonight and another tiara event in Stockholm tomorrow night, when the King hosts his traditional palace dinner for the laureates.